It seems completely unfair that so many property leases come to an end in January/February in New Zealand. It’s the middle of summer, and we should all be in the throes of some popsicle-fuelled montage of laughing on the beach, ruefully standing in front of an electric fan, prancing about under sprinkler systems on the front lawn, punting an endless cavalcade of volleyballs into the top-right corner of the camera frame, and, I don’t know, resting icy-cold cans of beer against our foreheads as the sun slowly goes down, letting the condensation run down the side of our faces and drip onto our jorts. Instead, thousands of us are staggering about in the humidity going from flat viewing to flat viewing to compete for underwhelming rooms against the forty-five other people at the viewing and wasting the best hours of our lives refreshing the flatmates wanted/for rent pages online. It is so stressful! And then if I even manage to find somewhere to live, I have to pack up all my belongings which is a deadly combination of boring and tiring; then there’s the matter of funneling every last dollar you’ve ever breathed on into the bond for your next flat, then you either have to get charged for moving companies or you have to literally break every bone in your body moving yourself, and then you have to unpack, but also you have to do all the other things you would normally be doing in this time while doing all that, like going to work and brushing your teeth. Hoofing a large quantity of white chocolate gingerbread brownies is not going to help with this in the long-term, but it does offer a brief and delicious respite. I recommend it whether or not you’re apartment-hunting, but for those of us in that boat, I really recommend it. Let the record state that I think white chocolate is easily the superior chocolate, followed by milk chocolate, then dark chocolate. White chocolate tastes of vanilla seeds, of pure creamery butter, of having a lucid dream that you’re into the air and sinking down upon a thick, fluffy cloud which supports your entire body weight for an uninterrupted meta-nap. Dark chocolate tastes of obligation and charcoal being rubbed against your two front teeth. It’s fantastic to bake with! I just don’t want to eat the stuff en masse. 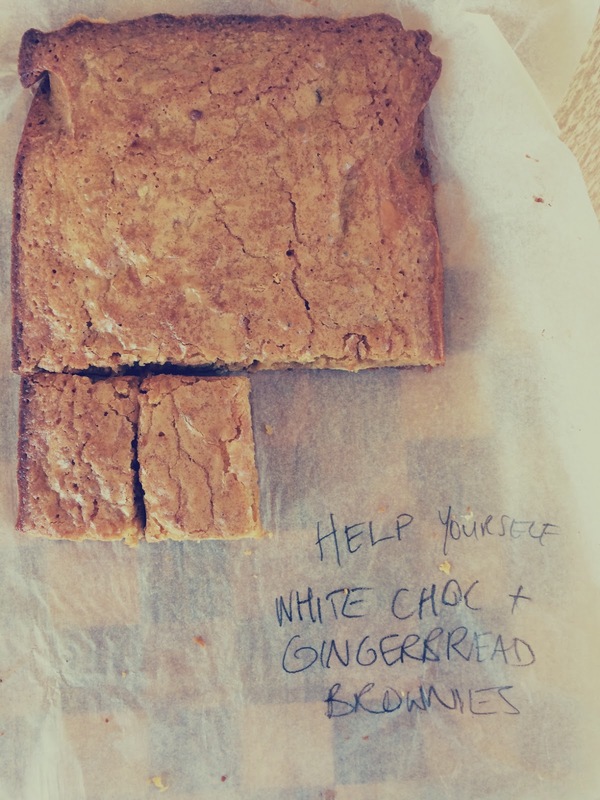 So with these brownies I took my beloved white chocolate and decided to pair it with ground ginger and brown sugar to create a kind of caramelly, gingerbready vibe. And the warm spiciness of the ginger against the gentle sweetness of the white chocolate is, I’m not gonna sugar coat it for you, an amazing combination. 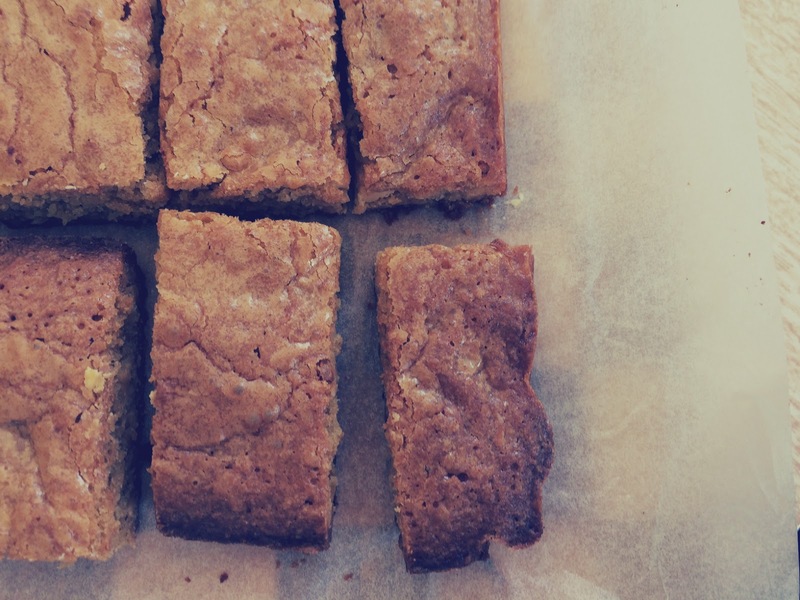 Like, just when you think the sugar is going to blowtorch your teeth into nothingness, the ginger comes in and lifts everything up, and just when it threatens to burn your throat with its intensity the white chocolate and cakiness softens everything. On top of that these are really, really easy to make. Which, when you’re feeling all fragile, is worth taking into consideration. 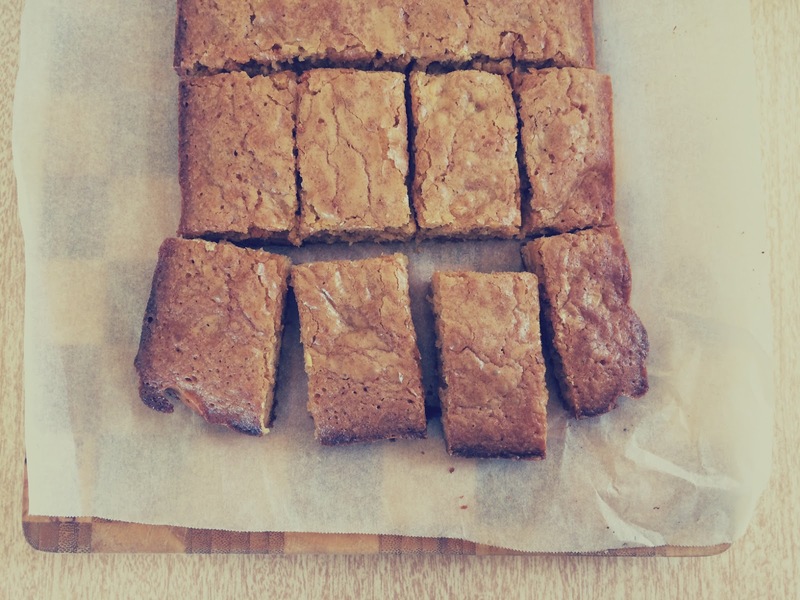 Set your oven to 180 C/350 F and line your usual brownie/medium-sized rectangular tin with baking paper. Mix the melted butter and sugar together, and – making sure the mixture isn’t at all hot at this point – beat in the eggs. Fold in the remaining ingredients, and spatula the lot into the baking tin. Bake for 25-30 minutes, until it’s firm and golden on top but still appears to have some below-the-surface squish. Allow it to cool a little and then slice it up. 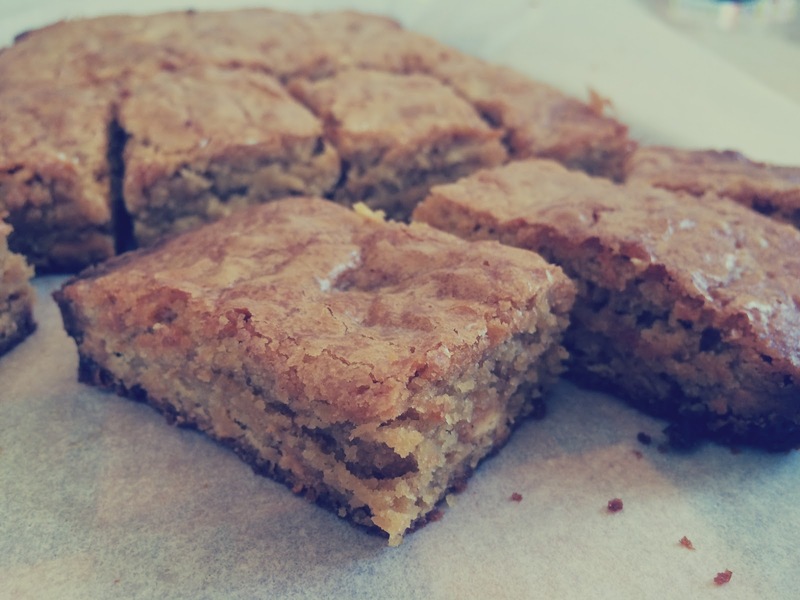 I was so delighted by these that after making a batch and leaving it for my flatmates (after inhaling like five pieces at once) I made a second batch to take to work for fun snack times, and even though I overcooked it slightly it was still really, really, really good. White chocolate and ginger, I ship them heartily. Speaking of really, really, really good, the other thing this week distracting me from the horrors of abode-seeking is that, and it’s really hard to not gasp until I faint while I type this, I made and wrote about a Crush Cake for Peter Gallagher’s O.C character Sandy Cohen on The Toast, and Peter Gallagher himself read it and tweeted me to say thanks! I realised that is actually an incredibly obscure and vague run-on sentence, so let me distill it down to: I adore this celebrity, I wrote about this celebrity, and then this celebrity actually read what I wrote and thanked me for it. WHAT! Isn’t that just THE MOST, to say THE LEAST? 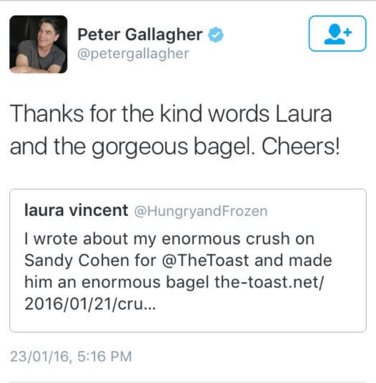 But even if Peter Gallagher hadn’t blessed me with his bestowal of gratitude, I would still have been perfectly content, because writing for The Toast is a majorly excellent achievement for me in itself and I feel like the story I wrote about Peter Gallagher/Sandy Cohen is the best one I’ve done yet. And also-also: for those of you also schlepping about trying to find somewhere to live instead of living your truth this summer, kia kaha but…please don’t take the room I want. title from: Blur, Chemical World, from their 93 album Modern Life is Rubbish. Damon Albarn is frolicking about in a field in the video and there is a bunny present and just like, get out of here Damon Albarn. And take your beautiful face with you. Lisa Stansfield, All Around The World. Such a damn classic and one of the very best bridges in songwriting history. next time: I finally, finally bought another SD card for my lovely camera so can start using it for food photography again instead of using my phone. Knowing my luck I’ve probably completely forgotten how to use it, but I’m looking forward to reacquainting myself.